Takara Japan will release the “Na Me~Ru” candy, which features a button o­n the grip shaft that will display a message when held. 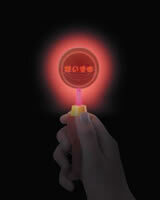 Pushing the button causes the candy to glow and display a message which is different for each of the six flavours. The messages are “I like you. A lot” (strawberry), “Happy” (lemon), “Break a leg” (green apple), “Thanks” (cola), “Congratulations” (orange), and “I love you” (peach). Two button-style batteries (LR44) provide power. On the surface of the candy is an illustrated facial expression that can be associated with the message.